Come along and ride the largest travelling Ferris Wheel in the southern Hemisphere located now at the Geelong Waterfront! The oldest piece of carnival, the Ferris Wheel brings magic and nostalgia to any event or city skyline. Whether you're young, or young at heart, a trip to any fair ground is not complete without a ride on the Ferris Wheel. HiLite Amusements are proud to present to you the largest, most spectacular Ferris Wheel that the Southern Hemisphere has to offer, The Giant Sky Wheel. 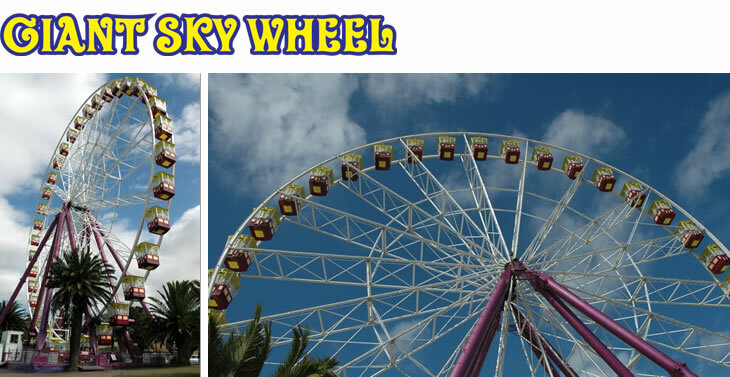 Come and ride the largest travelling ferris wheel in the southern hemisphere. Being only an hour by train from Melbourne, Geelong provides a wonderful day out. The Geelong waterfront is a cosmopolitan and vibrant area, a hive of activity with restaurants and cafes, beautiful landscaped gardens, attractions and public art. So come along, take a ride and check out the fantastic views of Corio Bay from the heady heights of the Giant Sky Wheel. Or if you prefer to keep your feet planted firmly on the ground, simply enjoy the atmosphere and excitement of the Wheel and in the evening the spectacular light show. Open 7 Days and all public and school holidays. Please note that the last ride will be sold 15 minutes before these closing times. Times and availability may change due to maintenance, weather or other operational reasons. Tickets can be purchased at the wheel. The ride which takes approximately 7 - 10 minutes.